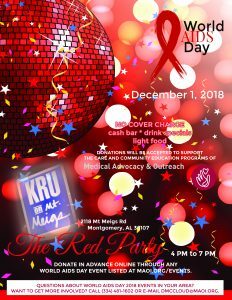 Join MAO and our friends at KRU for a social evening in observance of World AIDS Day 2018. Exchange stories and memories with us. DONATIONS WILL BE ACCEPTED TO SUPPORT THE CARE AND COMMUNITY EDUCATION PROGRAMS OF MEDICAL ADVOCACY & OUTREACH (MAO). Help raise awareness and remove stigma by making events like this possible. Join the World AIDS Day Challenge with a singe donation or donate and activate giving by others on social media.